All of the hype may be surrounding the upcoming Zune release but Archos isn't listening to any of it and today will announce the Generation 4 line of portable media players (PMP) featuring several devices that each raise the bar in a different area. Archos is also extending the usefulness of the Generation 4 players by offering three different modules that add DVR and camcorder functionality to the new players. First up is the Archos 404, a small media player with a 3.5 inch screen and a 30 GB hard drive that handles most any video format you want. This is all contained in a package that is .59 inches thin. Next up is the Archos 604 that also packs a 30 GB hard drive and couples it with a 4.3 inch wide screen. The 604 is only .63 inch thick making it one of the thinnest PMPs and probably the first with the big screen. The 404 and the 604 both work with optional modules to extend the utility of the device. The DVR station turns both players into a full video recorder that will save video from any input source at a programmed schedule. The DVR travel adapter lets you connect either player to any video source for a similar recording experience. The last option is the one that interests me the most as the helmet camcorder turns the Generation 4 Archos into a full-fledged video camcorder that records in MPEG-4 format up to VGA resolution.. The Archos 404 and 604 will both be available in early September starting at $299. Coming in the fall will be the new Archos 504, tthe first PMP with a 160 GB hard drive. Yep, I said 160 GB! DENVER - August 24, 2006 - ARCHOS, Inc., a global consumer electronics manufacturer and inventor of the portable video player, introduced today its Generation 4 line of portable media players, which include some of the thinnest, lightest, lowest priced products on the market, yet hold up to 700 hours1 of TV content for enjoyment anywhere. The five new ARCHOS products provide ultra portability with the ARCHOS 404 and 404 Camcorder, extreme capacity in the 160GB ARCHOS 504, and the latest technologies with the ARCHOS 604 and 604 Wi-Fi. The new products start at $299.99, can play all standard video formats2 in full DVD resolution, feature a consistent design throughout, and offer TV recording with the new DVR Station accessory. More information and photos on the Generation 4 line are available at www.archos.com .
. Capacity ranges from 30GB to 160GB, and the portable players start at $299.99. Consistent across the product line are sleek silver metallic casings, and a new graphical interface that make navigating through music, video, photos and documents a snap. All products feature large, bright screens with more than 16 million colors, right-side button configuration, and accessories such as TV recorders and travel adapters, making the devices easier and more intuitive than ever before. 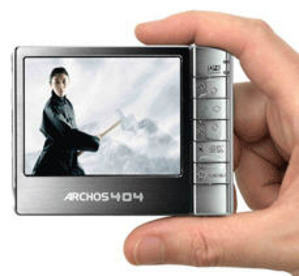 "Our new Generation 4 line-up demonstrates the dramatic evolution of the portable video player from our invention of the device back in 2003, with products that are smaller, lighter and less expensive, but with significantly larger screens and storage capacity," said Henri Crohas, ARCHOS founder and chief executive officer. "With our new players, consumers can enjoy hundreds of hours of their favorite TV programs in DVD quality on a device only one half inch thick." thick and a $299.99 price point. 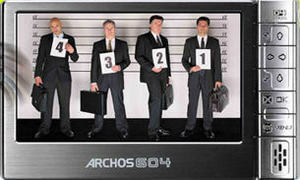 The ARCHOS 604 features an extra sharp 4.3-inch large-screen display, removable battery and kick-stand for easy viewing. ARCHOS is extending the 404 with an integrated camcorder, and the 604 with integrated wireless and touch screen features later this year. In addition to the five new products, ARCHOS is announcing a complete line of accessories that work with all video players in the Generation 4 line. New accessories include the DVR Station for recording hundreds of hours of video onto the device directly from a TV or DVD player3, and a new Docking Adapter for rapid charging and transferring of content to and from the device. The new DVR Station enables any ARCHOS portable video player to schedule and record movies and TV programming directly from any home entertainment source-TV, DVD player1, VCR, cable box or satellite receiver and to playback videos on a TV in DVD resolution and 5.1 surround sound. Previously an integrated part of the device, the new DVR Station as an add-on accessory enables ARCHOS to provide affordable portable media players for consumers based on their individual preferences and usage scenarios. Other new accessories focus on the importance of keeping connected to your device while on the road. These include a DVR Travel Adapter for recording content from a TV or cable box when away from home. The Docking Adapter enables the transfer of content onto the ARCHOS player directly from digital cameras, storage drives or other media. A new A/V Cable allows for viewing content from the device onto a TV, while the Helmet Camcorder offers hands-free recording where hundreds of hours of video can be captured and stored on the Generation 4 line of devices. Portable speakers, leather travel cases and other accessories allow for expanded entertainment options with the ARCHOS line. "I'm a Tablet PC. I'm a Mac." This is a hysterical spoof on the recent "I'm a PC. I'm a Mac." series of commercials. This time, it's a Tablet PC kicking a Mac's behind with the premise that you're more productive with a Tablet PC and that a Mac isn't for "work". I don't agree with the "a Mac is all for fun and video stuff", because you can certainly be productive with a Mac; nonetheless, the lack of a tablet from Apple is a perceived gap. Maybe it's just me that sees that gap; what do you think? Should Apple produce a Tablet PC? What benefits over Microsoft-based tablets would you be looking for? If pursuing profit is greed, economist Walter Williams told me, then greed is good, because it drives us to do many good things. "Those areas where people are motivated the most by greed are the areas that we're the most satisfied with: supermarkets, computers, FedEx." By contrast, areas "where people say we're motivated by 'caring'" - public education, public housing etc. - "are the areas of disaster in our country. ... How much would get done," Williams wondered, "if it all depended on human love and kindness?" Is John Stossel the only sane human being on Network Television? I think so, PLEASE point me toward another if they exist!!!! I am posting this from the Birmingham AL Intl. Airport. The Business has wired access booths with power strips. Well Done! Nice for me, as I arrived here well early (4 hours) given the reports of chaos yesterday. Small airport and advanced warning of new restrictions on carry-on items have mitigated the need. I have been able to surf a bit and pick up e-mail with the extra time. I will sign-off for now and go make passage through security. Read this to for the answer. "The New York Times reports that the respected astrophysicist, James A. Van Allen, died yesterday at the age of 91. Apparently the fellow regularly worked at his office/laboratory up until a month ago. Prof. Van Allen team designed the Geiger counter that flew aboard Americas first orbiting satellite, Explorer 1. It detected unexpectedly intense levels of radiation caused by energetic particles trapped in the Earth magnetic field, the magnetosphere. The belts of radiation were mapped and characterised by later missions and were named the Van Allen belts in honour of their discoverer." Country music group the Dixie Chicks have cancelled 14 concerts on their north American tour and delayed others. A spokeswoman said the number of concerts remained the same, with dates in Canada replacing cancelled US shows. A band statement said the changes were to "accommodate demand". Billboard magazine in the US has reported ticket sales below expectations. The band suffered a backlash in 2003 following remarks by singer Natalie Maines about US President George Bush. Following the tour changes, the Dixie Chicks' statement said: "This is a year where we weren't sure what to expect. "We were prepared for a lot of things as we figure out this new phase of our career." It added: "We hope that our fans who were looking forward to a stop that is no longer on the tour will be able to join us at a nearby arena this fall, and we are sorry for any confusion or inconvenience these changes have caused." The north American leg of the Accidents & Accusations tour kicked off in Detroit, Michigan, on 21 July. The band's first album since the furore, Taking the Long Way, topped the charts in the US this year and has sold more than two million copies worldwide. At a concert in London in the run-up to the Iraq war, Maines said she and bandmates Emily Robison and Martie Maguire were "ashamed" to share their home state of Texas with President Bush. US radio stations reported a flood of protests from listeners angered by the comments, while some dropped the band's music from playlists. The Dixie Chicks also said they received death threats, which led to them installing metal detectors at their shows.